The outcome of the elections in Greece brought momentary relief but did not bring an answer to the main question: whether ultimately the country will remain or rather - if it could remain - in the eurozone. According to many, both Greece and the EU will only benefit if Athens leaves the monetary union (but remains in the EU) and returns to the drachma. What is the probability of such an outcome, what are the possibilities and the risks, Raoul Ruparel and Mats Persson analyse in a paper, published by the London-based think-tank Open Europe. According to them, despite the political uncertainty and economic problems of Greece the most likely scenario (60%) is a compromise to be found between the political forces in Greece and the country's creditors. 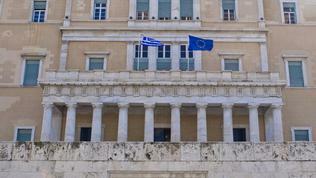 Judging by the events in the last two years and especially in recent months, however, this compromise would be too unstable and would need constant revalidation, because "without permanent transfers or willingness to accept a decade or more of austerity, questions over whether Greece can remain a member [of the Euro] will resurface before too long." If Greece leaves the eurozone it will be able to devalue its currency to promote economic growth and to obtain economic and political freedom. However, in order to benefit from these opportunities, the country should not leave the euro, at least not in the next six months, because at the moment the risks are much greater than the benefits, the analysts say. They identify two prerequisites for a manageable and relatively painless Greek exit from the euro: the banking sector to be recapitalised and restructured, and the country to achieve a primary surplus (excluding the cost of debt servicing) in order to cover its bills without external help. It is a different question why, once this is achieved, Greece would still be willing to leave the eurozone. According to the authors, "given the long term competitiveness problems and the unrealistic expectations of the Greek adjustment programme an exit at some point may return the economic tools to Greece which it needs if the economy is to grow sustainably in the future." If Greece leaves the euro, it will be able to devalue its new currency (according to the authors by around 30%), which would stimulate economic growth and increase exports by about 10%, although the result depends strongly on reduced demand in Europe. Devaluation would ease the pressure of budget cuts on the Greeks, although the country would still need immediate savings of 12 billion euros to pay its bills. If structural reforms do not continue, the analysis emphasises, the short-term benefits of devaluation would be wasted and there is no guarantee that an exit from the euro at that moment would end the policy of austerity, on the contrary. Another problem is that a large devaluation would be accompanied by an increase of inflation: "Citi estimated that inflation will top 20% for three years following an exit and then settle to around 7%." In any case, according to the analysts, Greece would still need external financial assistance, amounting to between 67 billion euros and 259 billion euros. And once having left the euro, Greece will have no guarantee that it will be given funding of that magnitude, especially if the exit is a unilateral decision of the Greeks. And even if it receives the money, conditions are unlikely to be less tough than the current ones. The biggest share of the money will go to the banking system because leaving the euro would mean that the Greek banking system will lose the support of the ECB, which is currently its only source of liquidity. In case of a eurozone exit, banks and pension funds would need immediate capital injection of 55 billion euros, "which would have to be provided virtually overnight" to avoid collapse, Open Europe`s analysis states. The banking system is further weakened by erosion of the deposit base - since the May 6 elections, over 3 billion euros have been withdrawn from Greek banks, mainly household savings, the analysts note. However, the news of an impending exit from the eurozone will surely cause mass deposit outflow and will increase the likelihood of serial bank failures. Leaving the euro will mean Greece to default on its debt that is still owned by private creditors, including its own banks, which, according to the analysis, will add up 22 billion euros to the financial needs of banks. Defaulting on all debt, however, could be problematic because, following the deal on debt restructuring in February, 63% of the Greek public debt is held by the official sector (the EU, the IMF and the ECB). If it defaults on this debt, Greece will not be able to continue to work with these institutions, to seek loans from them and even to remain in the EU. However, maintaining the debt means Greece would need money for servicing, which the country currently receives from outside and it would be difficult to obtain on its own. The central bank will have no other option but to print money. To cover the banks` needs for liquidity it will have to inject into the system new currency worth at least 128 billion euros (63% of the Greek GDP) or more, if the outflow of deposits increases. Bank nationalisation, as proposed by the leader of SYRIZA Alexis Tsipras for instance, "would likely be self-defeating", the analysis argues. The current balance sheets of the six largest Greek banks are equal to 113% of Greek GDP and taking on their liabilities would increase Greek debt to record levels. That is why the analysts recommend the Greek banking sector to be healed and the budget to be in surplus before the country leaves the euro, because then the exit would be more likely to be controlled and the contagion effect on the euro area to be contained. "In any case, given the uncertainty, inflationary pressures and risk of a banking sector collapse, if Greece withdrew over the next six months, the benefits of devaluation may not outweigh the cost of an exit." The analysts recognise that it is difficult to calculate the impact on the euro area but its problems will remain in the long term, although a Greek exit will reduce to some extent the political and economic uncertainty. In this sense, the euro will remain weak for a long time, which will not be helpful for Greek exports and will reduce the benefits of the new drachma devaluation. According to the Open Europe`s analysis, if it comes to a Greek exit from the eurozone, the most favourable option for all is Greece to leave the euro but to remain in the EU. However, this is legally a very complex task, although the authors offer a solution - a quick exit from the euro area based on Art. 352 of the Treaty on the Functioning of the European Union (TFEU), which allows member states to take measures (based on unanimity in the Council and the consent of Parliament) without the need for ratification by national parliaments. Either way, the decision for a Greek exit must be followed immediately by a Treaty change which, as we know, takes too long and is a risky activity, because each of the 27 member states can block the whole process and make it hostage to domestic political demands. 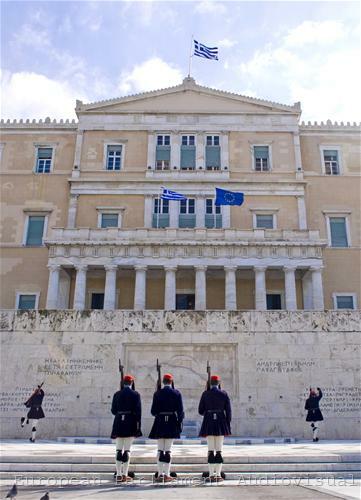 The analysts point out several political benefits Greece can derive from an exit in the long-term. First, a devaluation would reduce the need for spending cuts which would ease the political situation. Furthermore, "the Greek administration and political culture does not seem well suited to the supranational governance which is being touted as the future for the eurozone, for example, debt pooling in return for strict, binding and enforceable eurozone budget rules." The third argument is that a Greek exit would relieve tension and the growing hostility between Greece and other European countries, which could prove beneficial to the European project in the long term. All these arguments can be applied in full force to support the opposite view - that Greece should not leave the eurozone, namely because this would reduce the pressure for budget savings and reforms, and precisely because the political system itself is unable to provide strict and binding rules. And without these prerequisites, it is highly doubtful that the country will be able to take advantage from a possible exit from the euro in order to gain economic growth. The question is not whether Greece wants to leave the eurozone - the opinion polls clearly show that neither the Greeks want this nor the political forces are ready to take the risk. The question is whether at some point this could prove to be the only option. That is why, as Germany and the Netherlands have long insisted, legal grounds for leaving (even forcedly) the euro area should be provided, as well as mechanisms for resolving any issues arising from this.